Today I’m going to teach you how to sew with knit fabrics. 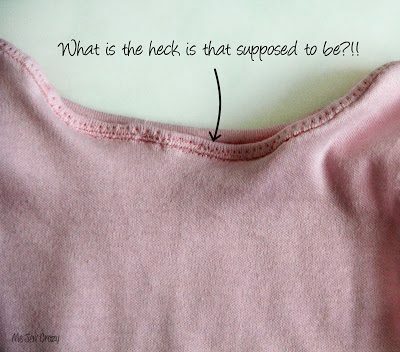 This post is broken down into several sections, including how to pick knit fabrics, knit fabric project ideas, and knit fabrics sewing techniques. 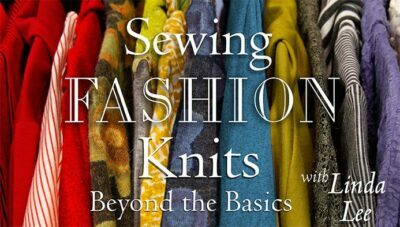 I hope as you read through that you’ll find something that is helpful to you and that you’ll enjoy sewing with knits! Earlier this week I alluded to something fun that I’ve got planned for my blog in March, a series on How to Sew with Knit Fabrics. A few years ago I challenged myself to sew more clothing. I’ve really enjoyed the resurgence so far. Before this I had not made a piece of clothing for myself since I was in high school. While doing this I realized that many of the apparel sewing patterns I liked featured knit fabrics. Since I am someone who is not easily intimidated, I took it upon myself to give it a shot and learn as much as I could about the subject. During the month of March I will be focusing on sewing with knit fabrics. Not every post will be centered around that subject (I’ll still be sharing some family recipes and fun seasonal crafts), but the overall focus will be on that. Now, let me say this first. I know I am not the first person to blog about this subject. It has been covered far and wide in the blogosphere. I’m not going to act like I’m the end all be all expert. 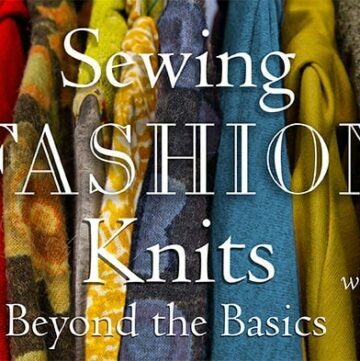 What I am going to do is tell you what I’ve learned sewing with knits and then give you some resources to help you learn more for yourself about it. 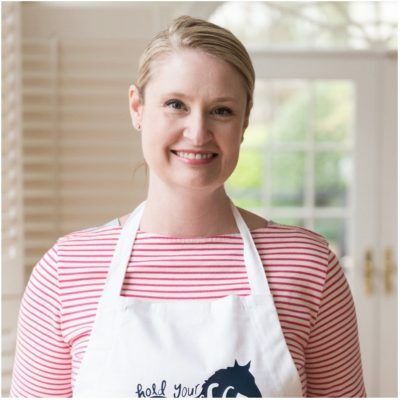 On Tuesday I had Heather of Girl Charlee Fabrics teach you a little bit more about shopping for knits (especially since many of us shop for fabric online these days). Today I’ll tell you a little bit about how to sew with them. Then next week we will dive into some fun projects. 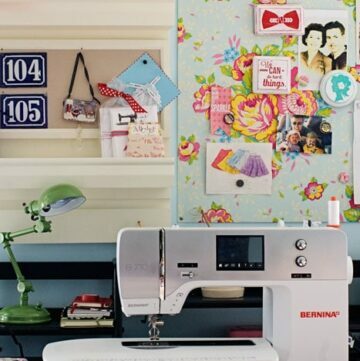 This is the main reason that people LOVE sewing with them. 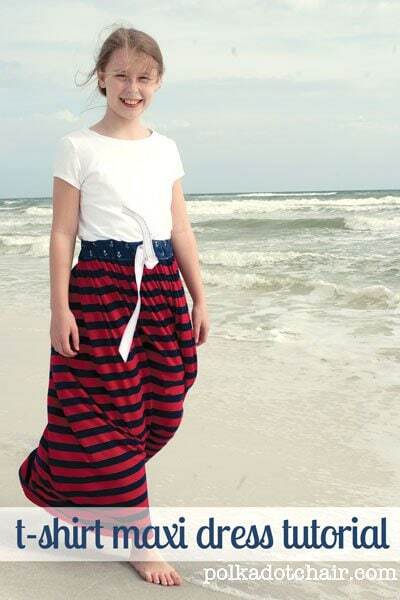 They are lifestyle fabrics and make soft, comfy wearable items of clothing. 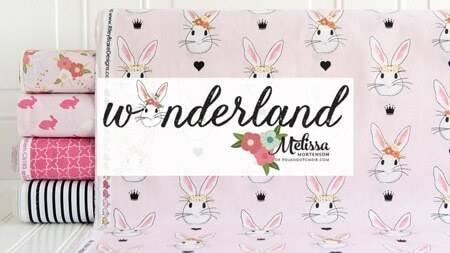 They are great for kids, babies, adults and even home decor. Because of the stretch apparel patterns can have a closer fit than a woven fabric. Example: If I was making myself a pencil skirt out of a woven fabric, I would make sure the skirt fit, but had ease, meaning it was not skin tight on me. I don’t want to bust out the seams when I sit down. If I was making the same skirt out of a knit, I would not need as much ease because the fabric would stretch as I moved. I would still not want it skin tight, but I would not need nearly as much ease as I would with a woven fabric. I’m sure there are some exceptions in the specialty knit department, but if you are working with Jersey, Ponte de Roma, Sweatshirt Fleece etc. They shrink, some of them more than others. You need to wash and dry the fabric before you work with it. Just throw it in the wash when you get home from the store, so it’s ready when you want to use it. I have a serger but it’s old and doesn’t work very well (that’s assuming I can figure out how to thread it). So I don’t use a serger to sew knits. I use my regular machine. These needles have a small ball on the end that prevents the needle from snagging the fabric as you sew. You can get them at your local craft or sewing shop. Here’s where people get tripped up. The fabric stretches, your thread does not. 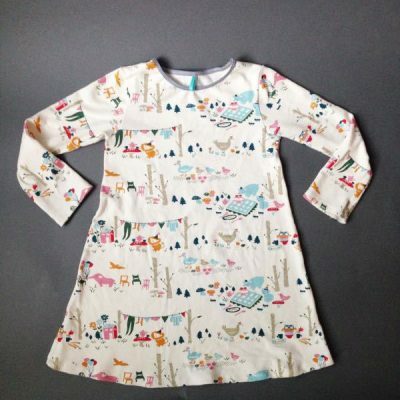 You sew something, pull it on over your head and hear “pop, pop pop”. You’ve popped out your seam. To remedy this you can do a few things. Use a thread specifically for knits (which I don’t use but I know many people like) or use a different stitch. I have found that it works the best is to sew with a very slight zig zag stitch and use polyester thread (cotton is not sturdy enough). The slight zig zag will allow the seam to stretch a bit during wear but won’t distort your seams either. I use an offest of 1 for my zig zag. Many machines also have a built in knit stitch. Try both and see which you like better. 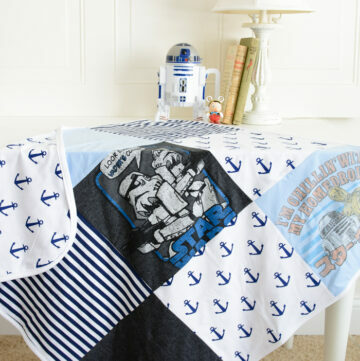 -Stretch the fabric slightly as you sew to prevent wobbly seams. -Use a double needle for your hems. Loosen your bobbin tension slightly so that you don’t get a bubble in between the two stitching lines. Sew on test swatches first. Play around with your machine until you find something that works. Also, don’t forget to BACKSTITCH every double needle seam. They have a tendency to unravel easily. 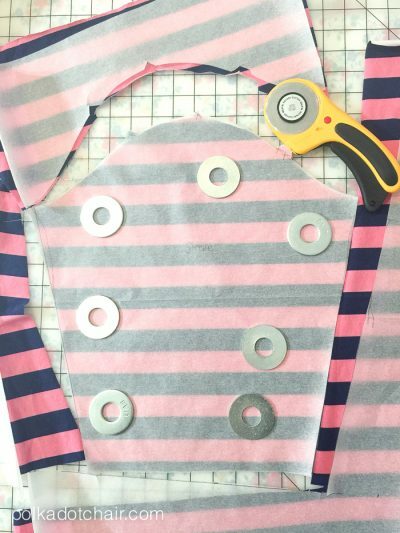 -Cut out your pattern with a rotary cutter. I find it easier to cut out knits using pattern weights (i.e. giant washers from the hardware store) and a rotary cutter. This way the fabric does not stretch as it is cut. Also don’t cut out more than one layer at a time. Cut out each piece individually. -You don’t need to finish the raw edges. Knit fabrics don’t fray. 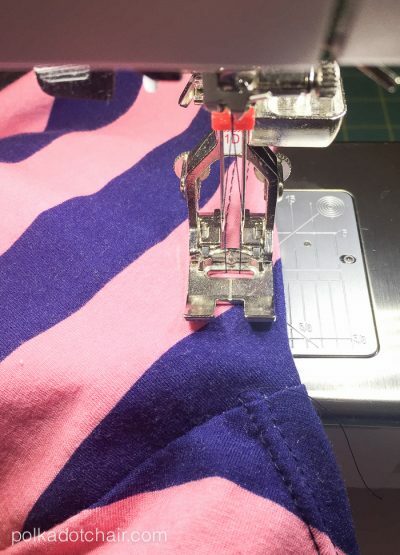 If you do have a serger then use it (it looks so nice) but if not there is no extra seam finishing necessary. I hope that you find these tips helpful! Knits are so easy and speedy to sew with. Like I said next week we will start with a few projects. I mentioned before that there is a lot online about this subject. Here are a few of my favorite tips, blogs and books on the subject (some are affiliate links). There is A LOT of information that can be digested about this. My advice is not to get overwhelmed or feel like you have to read EVERYTHING on the subject before you start. 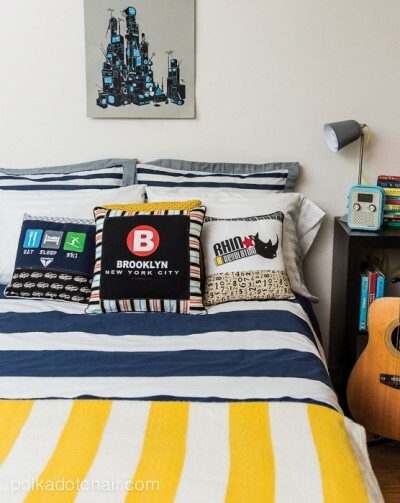 Just pick a simple project and give it a shot. 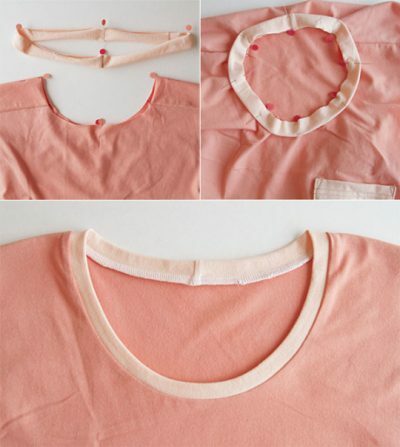 How to sew a neckline facing at Mad Mim. She has an entire series on knits. 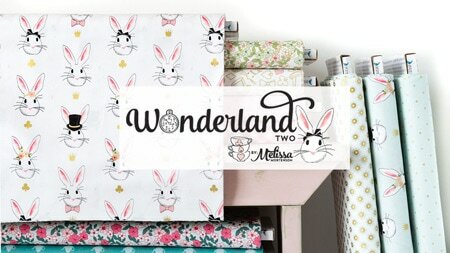 Make sure you check it out and spend some time over on her blog. 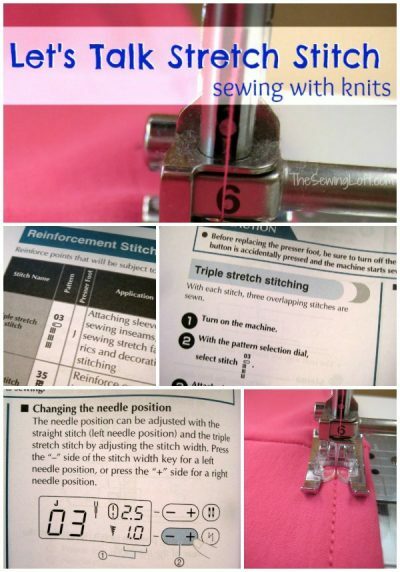 How to sew a Stretch Stitch over at the Sewing Loft Blog. Read though this post there is a lot of great information. 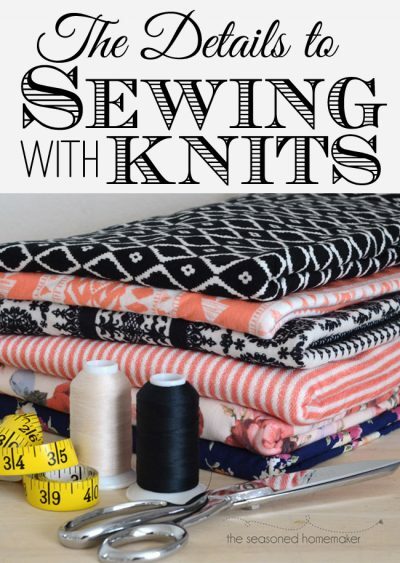 A comprehensive series and blog post about sewing with knits over at the Seasoned Homemaker. 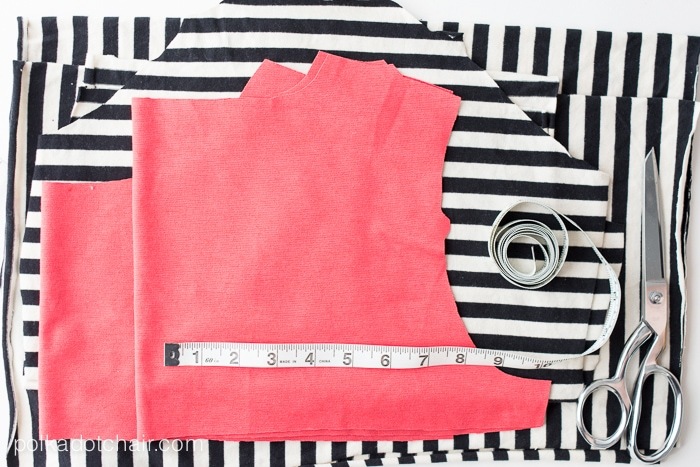 How to sew with Sweater Knits (you can totally do that, did you know??) over at It’s Always Autumn. 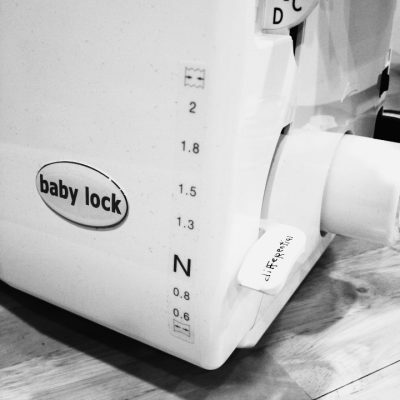 If you do have serger available to you, make good use of it. This explanation about differential feeds over at Simple Simon & Co. may just give you an “ah ha” moment. 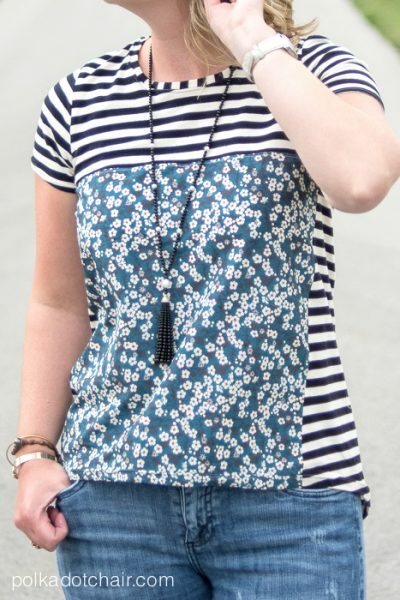 Rae of Made by Rae sews with knits extensively and is a great resource. She’s one of the people that got me interested in sewing with knits in the first place. No more wavy seams!! 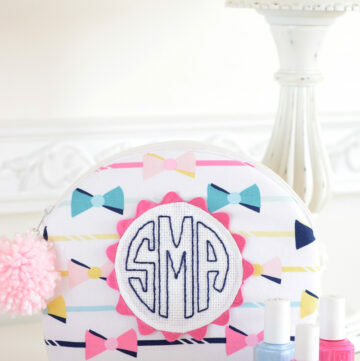 Check out this tip from Jess at Me Sew Crazy to get a perfect finish every time. 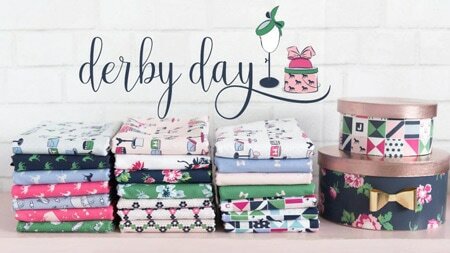 Dana at MADE has also been sewing with knits for years, and just launched an amazing sewing webseries. One of her latest episodes is all about knits, she walks you through making these cute and simple headbands. 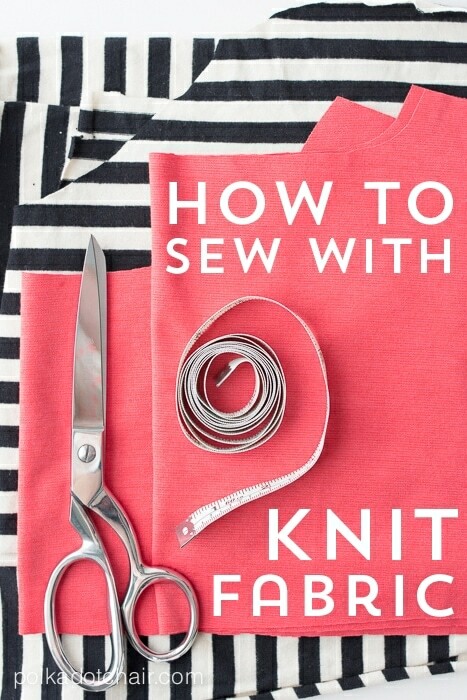 If you want to dive more into this I recommend this Sewing Fashion Knits class over at Craftsy. I’ve taken it and it helped me a TON. 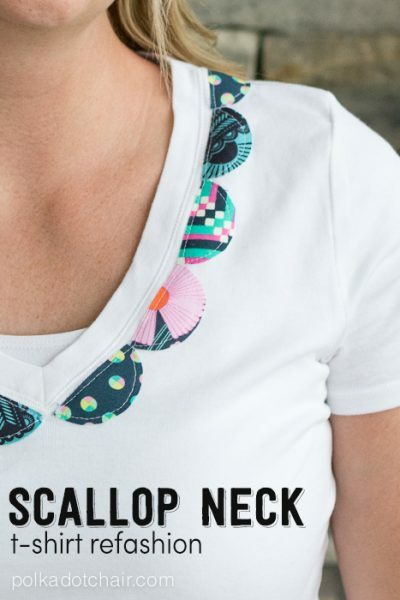 While you’re over at Craftsy also check out the Sewing With Knits Class (5 Wardrobe Essentials), Pattern Making for Knits and Sewing Knits that Fit. Also, I don’t have this book (yet) but I do have the other Colette Patterns dressmaking book and it’s excellent. I have no doubt this one is equally as great. The Colette Guide to Sewing with Knits. Whew!! That was a lot of information! I hope that it gives you a good idea of where to start if you’ve never sewn with knit fabrics before. I look forward to sharing the knit projects with you next week. Also, if you are a blogger who has written about sewing with knits, feel free to leave a link to your post in the comments! Thanks for all of the info. I’ve saved this page to Pocket to refer to later. I’ve not done much knit sewing but would like to. Especially since I wear so much of it. I have some I won in a giveaway I can play with. Maybe I’ll try out a smaller project like a headband you’ve shown. Thanks again for putting this together. I hope you have a fantastic day! Great tips!!! And just in time…I just bought some knits to make some t-shirt dresses for my daughter but wasn’t sure where to start. I’ve never really sewn with knits before!! Melissa, I make knit doll clothes for 18″ dolls. I always have a tough time starting the knits in the machine. The feed dog doesn’t want to grab the knit. Can you help? 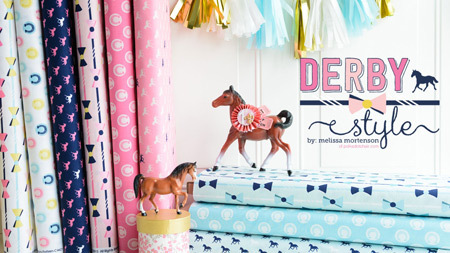 Try putting a piece of tissue paper under the fabric when you start. I’m sure this isn’t the perfect answer, but when I know I’m going to have a problem stitching from the very edge of the fabric to get started, I’ll start stitching maybe an inch into the seam, then after completing the seam, I double back and go the other way to finish that inch. As I said, not perfect .. but works!